In the time it takes most bands to put out an album, tour, and start thinking about making a follow-up, 20-year-old Cleveland native Dylan Baldi left college, became a songwriter, formed a band, and put out several records. The second full-length LP by Baldi’s band Cloud Nothings, Attack On Memory, finds the burgeoning tunesmith boldly stepping up the craft he displayed on last year’s Cloud Nothings, which came out not long after Baldi first started tinkering with home-recording his zippy, hook-heavy punk-pop songs. Recorded with the assistance of Steve Albini and Baldi’s touring band, Attack On Memory rocks with full-bodied physicality, adding heft to Baldi’s post-adolescent squeaks and thunderous power to his catchy melodies. It’s enough of a departure to give pause to those who loved Cloud Nothings. (It certainly confused some attendees at this year’s A.V. Fest in Chicago, where the band played the new songs live for the first time.) 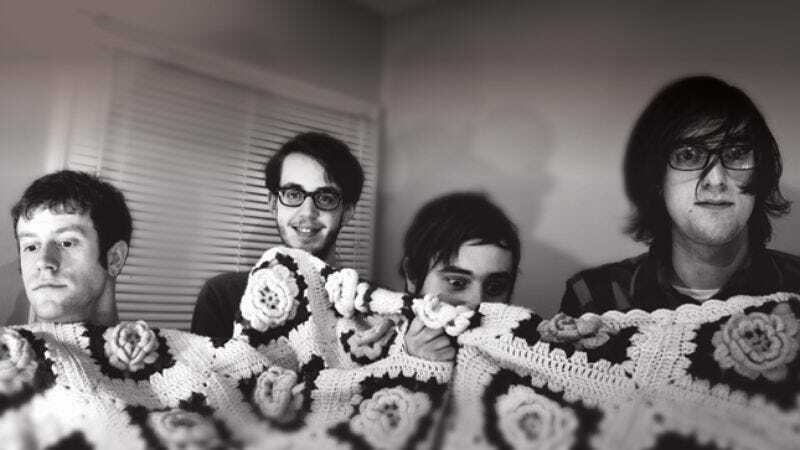 But for the most part, Attack On Memory stays in the same vein of feisty guitar-pop, establishing Cloud Nothings as one of the best young bands currently working in the genre. The A.V. Club spoke with Baldi about the album, Albini, and how big he hopes his band gets. The A.V. Club: You’ve talked about how this record is a considerable departure from Cloud Nothings. You even considered changing the band name, didn’t you? Dylan Baldi: For a second, I did. But that was kind of overreacting, I think, because it isn’t so different you can’t relate it to what we’ve done previously. AVC: It still sounds like a Cloud Nothings album, but it’s heavier than the last record, musically and emotionally. Is that a reflection of where you were at personally when you were making the record? DB: It was more a reflection of what I wanted the record to be. I wanted the beat heavier, and more aggressive, just because I was tired of playing light and airy kind of pop music. I was looking to play something a little more intense. AVC: Were you listening to different kinds of records? What inspired you to go in a heavier direction? DB: I did, for the first time, listen to The Wipers, about a year ago, and they’ve since become one of my favorite bands. They were a huge influence on this record, and they have some heavier moments. And I guess I’ve always listened to music that is heavier, but I’ve never chosen to be influenced by it in what I’m writing. AVC: How exactly did The Wipers influence you? DB: Well, they’ve influenced the songwriting, just in that I really structured those songs exactly in the way Greg Sage structures his songs. The way it flows from one part to the next is really Wipers-y. And also I got really into his guitar tone, and the way he plays guitar, and I think I may have picked up some of that. That’s on our record, too. AVC: Compared with Cloud Nothings, Attack On Memory has a real “band” sound, with long instrumental passages in some songs. Did you make this record differently? DB: The other records we’ve made, that’s all just me. The band hasn’t played on any of them. So that’s another big reason that it probably sounds that way. Because even though we’ve played some of these older songs as this band, we’re playing them more aggressive, they don’t have the same shape that these songs do. These songs just sound different. AVC: Do you think you’ll continue to work that way in the future, working as a band as opposed to you just working by yourself? DB: Yes, it’s more fun. It’s more spontaneous; you can try stuff out really quickly. Like that part in “Wasted Days”—that’s a four- or five-minute instrumental break, it’s something that I wouldn’t have done if I was just recording on my own, because it would be really boring. It would be boring for me to guitar solo over myself, over and over. And also, because I didn’t know if it would work without me trying it, and it would take a long time to try it, I probably wouldn’t even try it, and I might just write something simpler instead. But to do it with a live band, you can just try it, and if it doesn’t work, you know it right away. So it’s fun. AVC: You’ve talked about how this record is bit depressing in parts. Where did that darkness come from? DB: That was really just a matter of—I only realized at the very end when I listened to the whole album and I was like, “Wow, this is kind of a downer. This isn’t like anything we’ve done before.” And I think it’s partially because I was consciously trying to write differently, and also because I wrote these more with the band, and they kind of made their own parts, and brought their own influences into it. So it’s not just me dictating what’s going on. Everyone kind of had their own input, and that changes a lot. AVC: You’ve talked about the non-relationship you had in the studio with Steve Albini, which isn’t that surprising if you know how Albini works. But I’m wondering if you were disappointed at all with the experience. Were you hoping that it would be different than it turned out to be? DB: No, not at all. I knew exactly what was going to happen. I wasn’t looking for him to tell us what to do, or whatever. I was just looking to hear our music sound like it was produced by him, because it’s a good thing. And he was nice, he’s a nice guy, and it wasn’t a bad experience at all. I think that main quote that people pull from that [Pitchfork] interview takes it out of context and makes it sound like I really hated working there or something. I was just saying what happened while we were there. It’s fine that he played Scrabble, I don’t care. If the record sounds good, that’s all that matters. And he’s a nice guy, we got along, so I was more than happy with it. AVC: Were there any specific records that he’s done that you were hoping this record would sound like? DB: Yeah, most of the records he’s done in the past 15 years all have that one really specific drum sound, which, in my opinion, makes his recordings sound like his recordings, at least of other bands—I wouldn’t say necessarily of his bands, but of other bands. So I was just really hoping we could get something like that on our record, and we did, so I’m happy with it. AVC: The first song on the record, “No Future/No Past” sounds like a song that could have been on In Utero. Was that what you had in mind when you recorded it? DB: Um, no. I don’t really listen to Nirvana too much or anything. Other people have brought that up, too, and the only thing I can think of is Kurt Cobain loved The Wipers, and a lot of other music that I did, so maybe I’m coming to a similar conclusion as him, based on what I’m influenced by. But I wasn’t trying to write a song that sounds like Nirvana, or something. AVC: Most Cloud Nothings songs were written when you were a teenager. Do you feel like you’ve already outgrown those songs? DB: Oh, definitely. We’re, as a band, probably sick of all those songs, just because we’ve played them all so much. I really don’t see us necessarily playing any of them on this tour coming up, unless someone really wants to hear them. If someone comes up to me and says, “Hey, will you play this because it’s my favorite song?” I would do that. But, for the most part, we’re really tired of doing what eventually became a kind of robotic thing, playing the same song every night in the same set, same everything. So we’re trying to do a little more with this new stuff. AVC: When you make a record that you know is a little bit different than what you’ve done in the past, are you worried on any level about how people are going to react? DB: I just put that out of my mind. Because if I worry about that, I start trying to please some other person and worry about every little thing that everyone says about what we do, and I really try not to do that. I try not to read anything that anyone writes about us at all. I just try to do stuff that makes me happy with what I’m doing. AVC: But as the band gets more popular, that’s got to be more of a challenge to do, to block that stuff out. DB: It is. Especially over the past couple of months as this album has been building up. But I try to. If I read something that’s negative, and I think valid, I’ll think about it. But if it’s negative and pointless, then I try just not to think about it. I don’t worry about it at all. AVC: How long have you been writing and recording songs? DB: The first songs I ever made, pretty much, were on that first Cloud Nothings record. AVC: How old were you when you did that? AVC: What was the inspiration for you to start doing that? DB: I wanted a reason to leave college. I was searching for a reason to actually go and make some sort of productive living out of—no matter how small or meager a living it is—because I really wasn’t enjoying myself in school at the time. So that was kind of the impetus to taking it a step further and really trying to make something out of what I was doing. Because I’ve always played, and I’ve recorded stuff in the past, but it wasn’t necessarily a song; it was a whole ambient thing, or whatever. Those are my first “song” songs. AVC: Have you always been working in this vein of melodic guitar-rock, or did you have other phases earlier on when you were just a kid playing around? DB: Pretty much always when I sit down to write a song I write it on a guitar and I’m mostly thinking of melodic guitar stuff, because that’s mostly what I listen to, bands that are four- or five-piece rock bands. That’s not all I listen to, but the vast majority of my favorite things are made by bands like that. AVC: When you were trying to get out of college and recording what became those first Cloud Nothings songs, were you hoping, “Okay, maybe I can parlay this into a career”? DB: I wasn’t thinking “career” necessarily. I wasn’t thinking career so much as something to do, essentially, that is fulfilling to me in some way. Something I can apply myself to and feel good about doing. That was the only goal, really, and still is. AVC: How prolific are you as a songwriter? Are you writing songs all the time, or do they come in batches? DB: I try to write at least a little bit of something everyday. Some days I’ll write a couple songs and some days I’ll write a little part to some song that doesn’t exist yet. I tend to have a lot of material sitting around waiting to get used. AVC: Is there anything in particular that inspires you to write a song? DB: Yeah, definitely hearing certain things. When we’re on tour I don’t get to write as much at all. I’ll hear something that we’re listening to in the van and I’ll go, “That’s kind of cool, maybe I’ll want to try writing something like that,” and I’ll write it down when I get home, try to work it out. But for the most part I just kind of get excited about writing music. I’ll get excited about music for music’s sake, and writing a song is fun for me to do, so I don’t really need much inspiration to sit down and do it, because I really enjoy it. AVC: Where do you see the band going in terms of its popularity? How big would you want this band to get? DB: [Laughs.] I don’t think about that too much. We get as big as we get, I guess. I’m not expecting us to become a huge, popular band, because I don’t think we write the kind of music that would make us into that kind of band. So, naturally, just gaining a few new fans with every show, every time we release a record. That’s completely fine with me. And maybe in 10 years, you know, we’ll be doing really well for ourselves, or something. For now, I’m just seeing us sort of slowly increasing in popularity with every record we release.